We take pride in one on one coordination of every event and it helps us to get to know you and your musical tastes. B.O.G. performs the hottest hits you hear on the radio today blending in music from the all the years of the 80's, 90's, R&B, Rock & Roll, Soul, Motown, Funk, Swing, Country, 1940's, 50's, 60's, 70's, and a wide variety of Ethnic music which includes an extensive list of Hora's, and music from around the world. 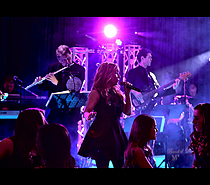 We love what we do and we are committed to making your party the best party you have ever been to! This is a partial list of songs that the band performs. If you don't see a song you are looking for contact us! Latin, Horas, Jigs, Italian Feast Music...you name it, we have probably done it. We have outgrown our ability to put ALL the songs we know on one list. If there is something you are looking for let us know!